Year-end lists are inevitable. Best movies, TV shows, books, podcasts, and of course restaurants. The restaurant lists stress me out, as they inevitably emphasize where I failed to dine this year. 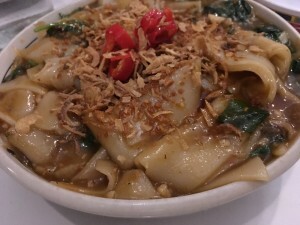 One of the restaurants sitting high on my “to do” list has been the Taiwanese/Cambodian Maketto. Maketto is owned by Chef Erik Bruner-Yang, who is beloved in DC for his tiny and always packed Toki Underground. Maketto opened in April 2015, as more than a restaurant. It’s a store, it’s a cafe, it’s a gathering place. It’s super! Maketto is on H Street, NE, not the most convenient location for a Marylander. Parking is scarce in the neighborhood, and Metro doesn’t quite get you here. (If only that streetcar did more than coast up and down H Street in test mode.) I visit the cafe just two days after it opens, and am amused when a greeter asks “is this your first time here?” The cafe menu is abbreviated, and while I am impressed with the buns, pork noodle soup, and Vigilante coffee, I want to experience the restaurant more fully before writing about it. Maketto is an ideal destination for my visiting Cleveland family, marking the celebration of my niece’s 21st birthday. I choose the spot as a pre-birthday dinner, which we pair with an exhilarating round of mini-golf at the nearby H Street Country Club. Our party of six tackles a good bit of the menu, which is divided into small portions and large. Small portions include steamed bao buns with pork and pan seared buns filled with leeks and mushrooms. 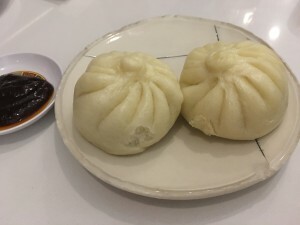 I eagerly dip the bao buns in hoisin sauce, rewarded by the sweet and spicy shredded pork that emerges from the spongy bun. Vegetarians need not be envious. The leek buns are equally exciting. 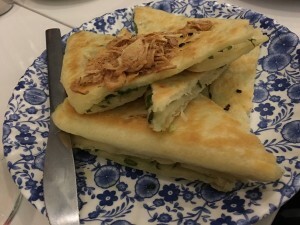 Scallion bread features layers of pan-fried dough filled with scallions and topped with fried shallots. We slather the bread with dabs of scallion butter and dig in, leaning back into our chairs as the smiles on our faces simultaneously expand. Crispy dumplings filled with gruyere cheese rest atop rich braised beef. 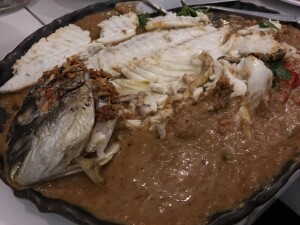 The dish impresses with its symphony of textures and flavors- soft, creamy, crunchy, warm, and spicy. A sprinkling of slaw on top adds a cool touch. Taiwanese fried oyster sustains the succession of dishes notable for pleasant surprises lurking beneath the surface. 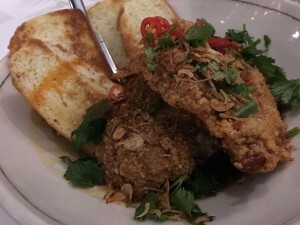 Fried oysters actually play a supporting role here, with eggs and pickled shrimp highlighting the well-rounded dish. 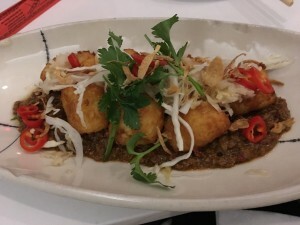 Local fried tofu with spicy basil sauce balances soft and firm tofu with vegetables and searing red chilis. To dig deeper into the dish is to appreciate it more fully. Thick wok fried noodles are bathed in garlicky mushroom sauce. We opt for a side of Berkshire pork belly to add heft to the dish, but it excels without any adornment. The vegan version shines. Grilled dorade resting atop thick, luxurious, coconut tamarind sauce is de-boned tableside. 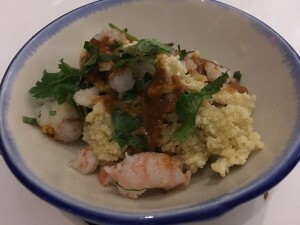 The generous helping of sauce yields leftovers to savor with steamed rice. I am full, but also filled with anticipation for the dish that arrives last- Maketto fried chicken and bread. It tops many year-end DC favorite food lists. I am primed to be amazed by crispy chicken elevated by Chinese five-spice and fish sauce. There is no question that this is the pièce de résistance. The chicken has a snap, crackle, and pop. My tastebuds are tickled by vibrant flavors at every turn. Maketto makes me desire the impossible: if only I had a superhuman capacity for consumption.